I’ve been so busy lately, I barely have time to procrastinate which confirms what I’ve always suspected: planning is but a series of decisions about what not to do so that I can do what I’d like. Sometimes this is simply not doing anything — or anything significant, that is. In the case of my food life, that means I’ve come to a complete standstill baking my way through Peter Rhinehart’s The Breadbaker’s Apprentice. Although I’m not a foreigner to bread baking, it isn’t something I’ve ever done routinely, and so any excuse not to keep the original pace I set along with others in the BBA Challenge group keeps me from taking on the next recipe. I suppose I could blame my delay on Bittman and his salads. After all, the hottest time of the year is finally drawing to a close here and so the ease of throwing a salad together after a very long day would keep most people from baking anything. Or perhaps it was that last gas & electric bill reflecting three completely decadent days of central air-conditioning. Honestly, I’ve slowed down on my salad production as well. Although I still cook most evenings, we don’t get around to eating until nearly 8pm, so the idea of photographing any of what I prepare doesn’t compete with flopping on the sofa, visiting with the resident menfolk, and staring at the television. No, the serious cooking usually happens on the weekend now, and last weekend seemed to feature roasted green chilis, or what are known as Anaheim chilis. I love them. 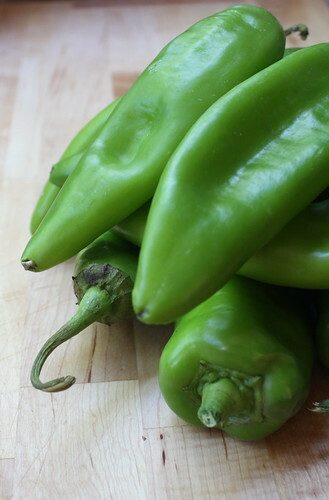 I love their glossy bright green color, the fresh crunch of a bite right from the raw chili, and the smoky aroma that fills our house whenever I roast them on the stove. 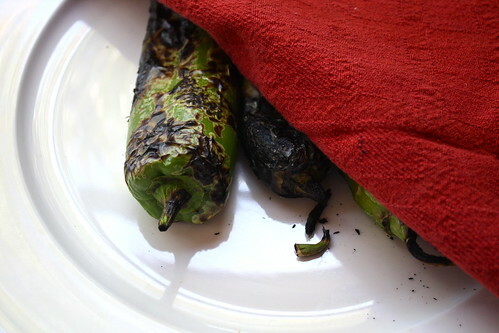 Also known as California Chilis, Anaheims are featured in chili rellenos. They’re especially good added to anything with cheese or eggs. I usually keep a can or two in my pantry, but they’re so easy to make I usually also have a few fresh chilis around. Occasionally they sit on the counter longer than I’d planned and turn red. Planned…yes, there’s that word again. I won’t tell you what I planned not to do last Sunday as I wallowed in my favorite room in the house, but I did make Bittman Salad No. 25, a Fresh Creamed Corn & Green Chili Casserole, some Pan Roasted Red Potatoes with Green Chilis and Onions and a Roast Chicken that sadly did not benefit from green chilis. 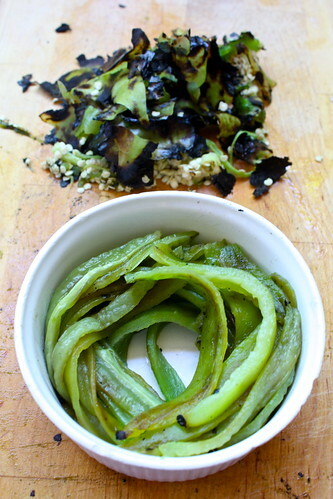 Let me know if anyone has made ice cream with green chilis and I’ll be first in line. 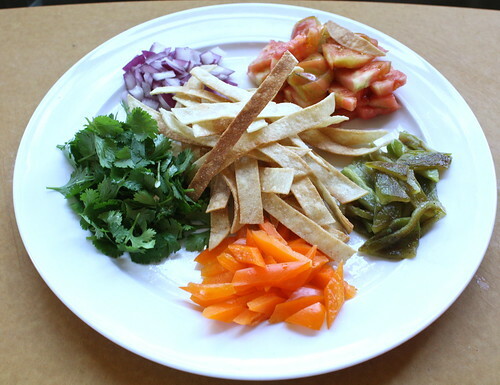 Bittman suggests that you can use packaged chips for this salad, and of course, I agree, but we usually have half a package of tortillas after a taco dinner, so it’s perfect to fry a batch of strips or triangles just to enjoy. In this salad, I used strips. Fry in hot oil in small batches so the strips aren’t crowded. Drain on paper towels, and salt well. 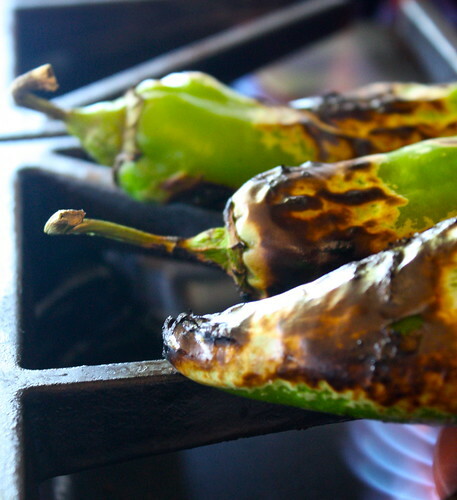 Arrange the whole fresh chilis over an open flame and turn frequently as skins blacken. When nearly completely black, cover or wrap in a clean, dry cloth for at least 15 minutes. 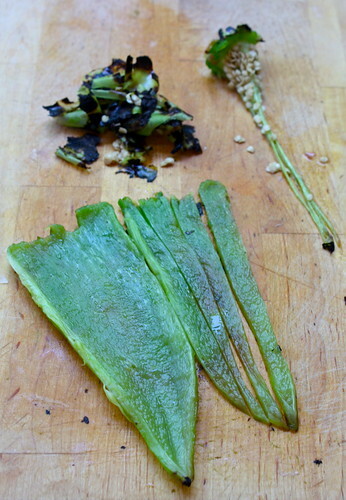 Then, peel and discard skin, seeds, stem, and membranes. Do not rinse! Slice into strips. Lightly toss all ingredients on a large plate and sprinkle chili lime salt over. 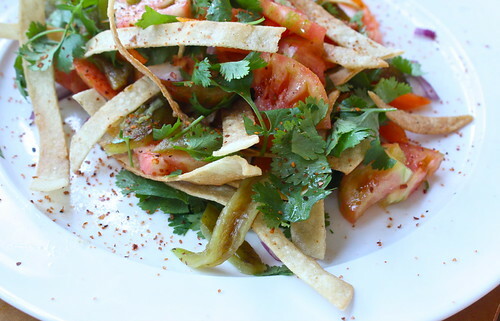 This salad has a lot of great flavor and texture, but I’m partial to these flavors. I had to restrain myself from adding avocado. 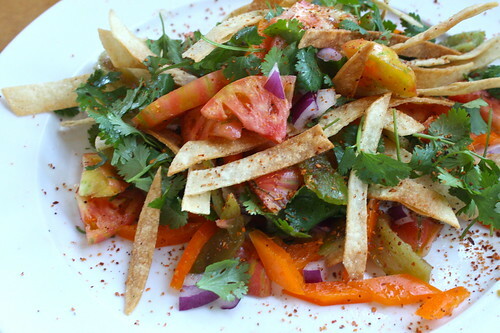 With no salad dressing which is usually loaded with fat this salad is diet-worthy. 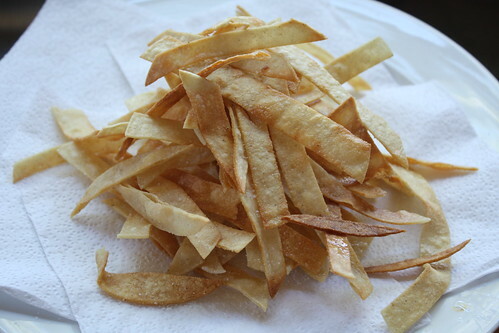 Sure the tortilla strips were fried, but if the oil is hot enough, you’ll find there’s almost no oil on the paper towels you place them on after frying. Besides, how many strips end up in a serving of this? Four of us enjoyed this salad. That’s not a lot of calories. Chili lime salt is one of those things one could find herself obsessing over. Easily. Such a great way to get flavor with little or no effort. It enhances whatever it’s sprinkled on. This is one of Bittman’s best. Truly.